It’s always very fortunate when you have friends who live in wonderful places, especially when you can go and stay with them for a few days. It is even more fortunate when said places are located between 30-50 degrees of latitude (where the grapevines grow) and home to lots of lovely, lovely wine. Chris and Ian live in Liausson, a small village in the Languedoc-Roussillon region in the South of France. It’s a beautiful, historic little place with Lac du Salagou to the north (or just a fifteen minute walk down a dusty road from Chris and Ian’s house) and vineyards in every other direction. Life is good here – visitors dedicate songs to this place (Liausson Blue by Antonio Longhi is but one), inspired by the very particular blue of the lake and the tranquil, slow pace of the day; there are bike rides and hilly treks, swimming and sunbathing – and, in the less active moments, there is wine, which is a part of almost every occasion. As you may know, Languedoc wine has had a rollercoaster of a history. It started off well, with a reputation for high quality wine for well over a thousand years (from the 4th century to the early 19th century). Wines from St. Chinian were even heralded as magical and in the 14th century were prescribed in hospitals for their healing powers. However, people seem to forget all about the good times when things start to go wrong… Two things (pretty big, unstoppable things) were responsible for the Languedoc’s reputation going a bit sideways: 1. The Industrial Revolution, and 2. Phylloxera. The Industrial Age in the late 19th century brought with it the need to satisfy a growing workforce. Enter ‘le gros rouge’ – mass-produced cheap red wine from the Languedoc, which was so thin it was normally blended with strong, full-bodied Algerian wine to make it more palatable. And then we have phylloxera – the wine industry’s immortal enemy. It’s a pest that attacks vines, and although the 19th century phylloxera epidemic affected most vineyards across Europe, many of them were salvaged by planting resistant American rootstocks. Yet, where the Languedoc was concerned, the American rootstocks didn’t take well to the limestone soil, and so many of the high quality vines of the Languedoc were lost and the lower quality ones like Aramon, Alicante Bouschet and Carignan, were planted in their place. So, although there were two things that severely damaged the Languedoc wine industry, there were two things that saved it: 1. Algeria becoming independent in the 1960s and no longer using their wine to make Languedoc wine taste better, which forced winemakers to improve the taste and quality, and 2. French consumers changing their tastes and demanding higher quality wines. For the last thirty to forty years, winemakers in the Languedoc have switched their focus to quality and making a good brand name for themselves, some adopting the AOC classifications and some making the shift towards single varietal wines, which New World wine consumers look upon favourably. Now, the industry looks to be in good shape – certainly I’ve seen wines from the Languedoc on many a wine list in London and I also attended the Sud de France Annual Tasting earlier this year, where the region’s success was celebrated. After sampling some excellent Languedoc wines at the Sud de France tasting and at the London Wine Fair this year, I couldn’t wait to get stuck in and taste these wines in their sunny place of origin. We arrive at Chris and Ian’s at around 6:00pm and waste no time diving into the local wines – we literally dump our bags and head to the village bar, La Cave, a few steps away from their front door. Before La Cave opened earlier this year, there was no bar, café or pub in Liausson, and all the communal wine drinking was done on the pavements outside homes – which was perfectly fine, but the locals have welcomed somewhere to convene and chat about the day’s events. It has also brought in some tourists, looking for a place to wet their whistles after a morning of motoring across the country, immediately making this small collection of homes surrounding a church seem part of a bigger world out there. La Cave itself has an interesting history, whereby wine used to be made inside its old walls – in fact, the Mayor of Liausson, Alain, used to make his wine here. 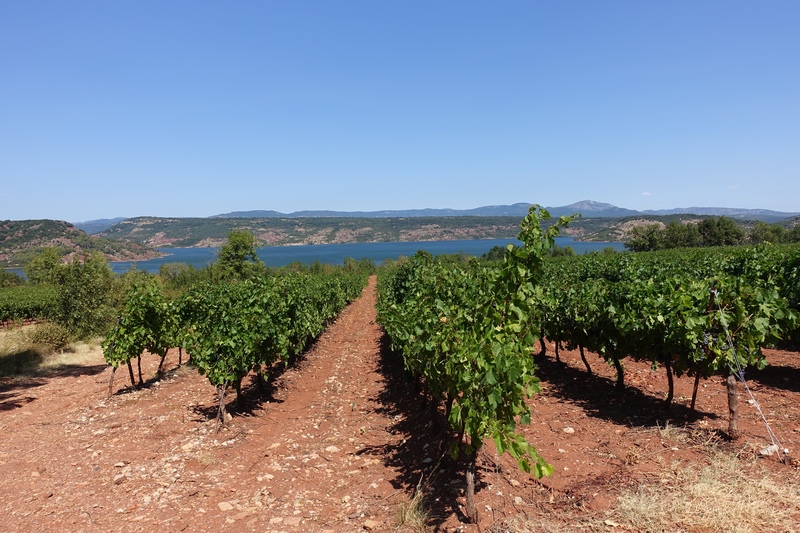 He now makes it down the road in his winery overlooking the stunning Lac du Salagou, but it is still his Salagou 34 that we drink now in La Cave. Alain makes a red called Eruption and a rosé called Friandise – the latter being extremely popular with the locals, as a refreshing, strawberry-scented sip that is heavenly on a hot day. Curious to try the red, we open a bottle of Eruption, a nod to the chain of volcanoes that shaped the dramatic landscape around the lake. Making the area even more picturesque is the ‘ruffe’ rock – red soils made up of clay sediments and iron oxides, which provide the vines with lots of rich minerals and nutrients. The wines here are normally produced by blending Grenache, Syrah, Cinsault and Carignan grapes, and are often enhanced with Bordeaux, Cabernet Franc, Cabernet Sauvignon and Merlot. Eruption is a clear, ruby red and has notes of red fruits, in particular red cherry, plum, raspberry and a hint of blackberry too. It’s soft and smooth on the palate, fruit-forward, a trace of spice and a short finish. It’s very drinkable – we like it a lot – and get through a bottle between four of us perhaps a little too quickly! It’s a simple wine that can be drank on its own without food, but it would also be nice with nibbles or light dishes. It could even be served slightly chilled, so it would be a nice change for the rosé lovers that are after something tasty and still refreshing. Happy, relaxed and a little more loose, we head back to Chris and Ian’s house. We are in the mood for wine and end up opening three more bottles to accompany our Mexican-themed supper. The first two wines, Mazer and Latude, are from a local winery called Les Vignerons de Fontès and serve as a little taste of what’s to come on our trip. Both are very decent wines; my favourite is Latude, made using a rich and intense blend of Grenache and Syrah. The third bottle we try is a special present from Betty and Cedric, the couple that run La Cave – a 2012 Domaine d’Ardhuy Aux Clous, Savigny-Les-Beaune Premier Cru from Burgundy, made from 100% Pinot Noir. What a fantastic wine. Elegant, with juicy red fruits, sweet spice and a velvety mouthfeel – it fills the palate and lingers on and on. We feel very honoured to share this with Chris and Ian – thank you Betty and Cedric! Although we end our evening in Burgundy, we’ve had a wonderful introduction to the Languedoc in our first few hours on the red soil of Liausson and our palates are primed for more.